This is a 1987 MIJ Fender Strat pickguard wired-up with a Lace Sensor Blue in the neck, a Lace Sensor Gold in the mid, and a Seymour Duncan Hot Rails humbucker in the bridge. 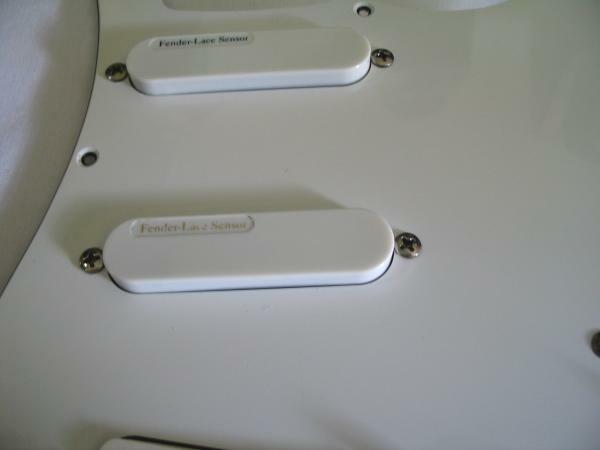 The volume and tone control 1 are the original 250K Fender Japan pots and the switch is original as well. 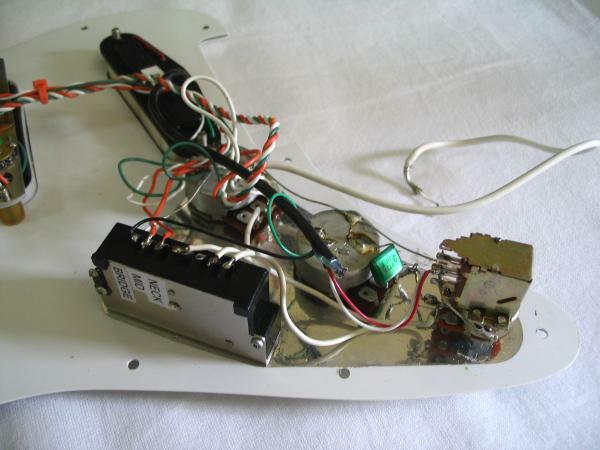 Tone control 2 is a push-pull 250K for coil splitting the Hot Rails pick-up (UP is single-coil mode, DOWN is humbucker mode.) 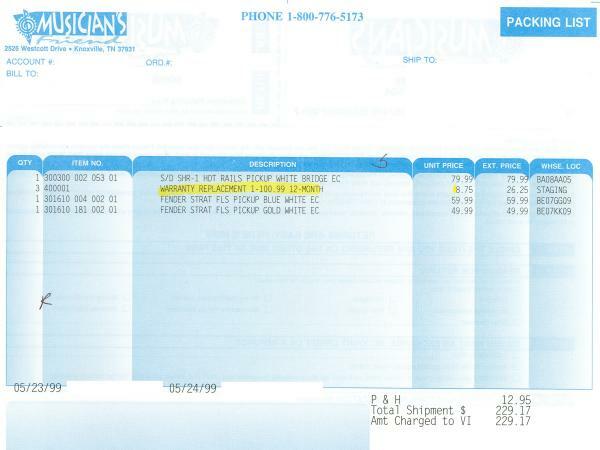 I got the pickups separately from "The Friend" (see receipt), and had the 12th Fret in Portland wire it all up while I was getting a refret on the same guitar (Spring/Summer 1999.) 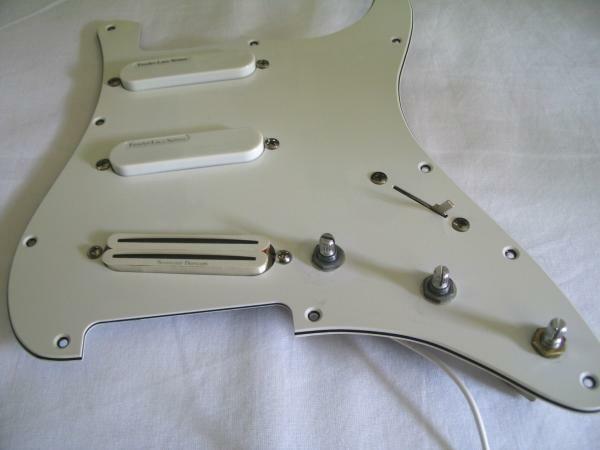 The pickups were about $189 and the labor + extra parts was $65. Basically, this is ready to stick on a guitar as-is. Wire up a bridge ground and the shielded output jack wire and you're good to go. The pictures are a little dark (sorry 'bout that), so note that the pickguard itself is white, not cream as it may appear in some of the darker shots. 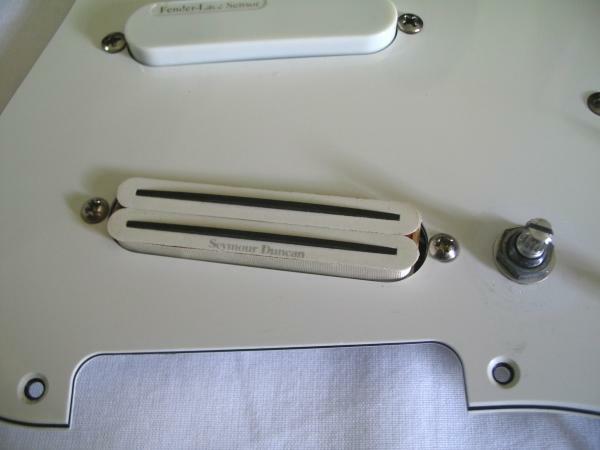 It isn't absolute "paper white", maybe a shade or two darker than a brand new Strat pickguard. It is 18 years old now and has playwear (hairline scratches from picks) and some scratches underneath where the knobs sit. Still looks good, though. No cracks or ugly discolorations. The pickguard has 11 holes and my *understanding* is that it will fit a USA Strat, though I can't be sure of this -- no guarantees. I don't know if it'll fit a Mexican Strat or any other foreign bodies except for an 80's MIJ -- no idea if it'll fit a non-Fender body. You may just be interested in the pickups (or just one pickup) which I definitely understand. My prefence is to just sell everything as one piece, and at $1 starting and NO RESERVE, I think you'll get a great deal. 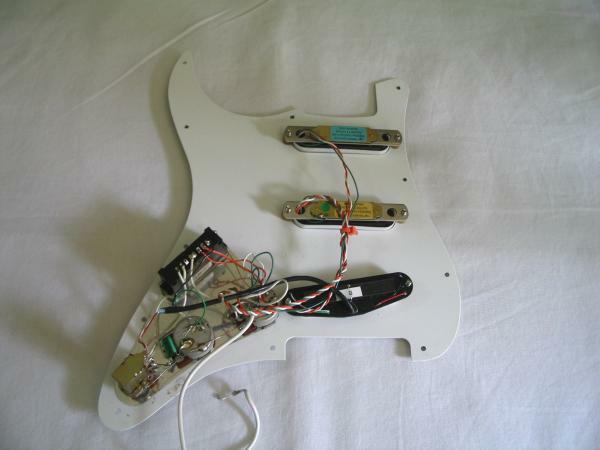 A hobby guitar builder will definitely find something useful to do with all of the parts on the pickguard, even if not in the current configuration. 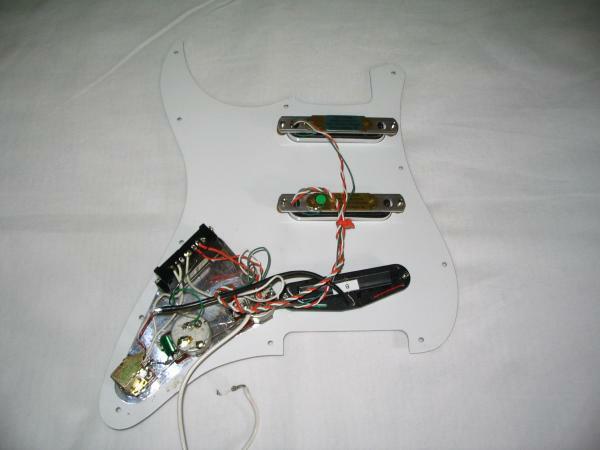 Then again, somebody may like the pickups and wiring it as-is. 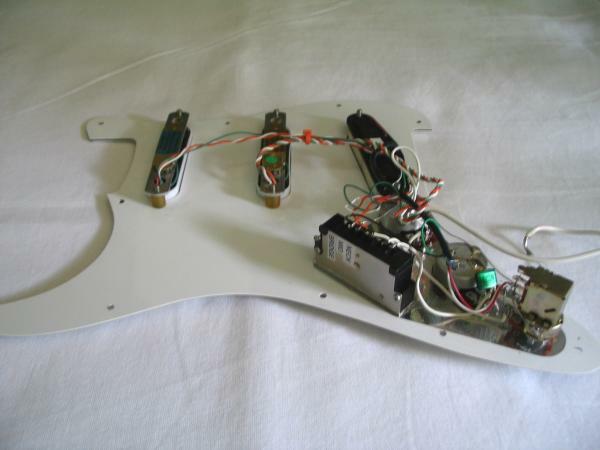 The neck and mid pickups are Lace Sensors. 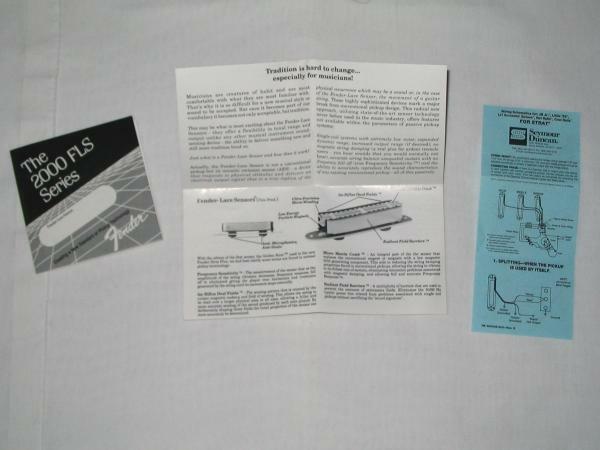 They are about as next to noiseless as you can get, which was pretty much the original appeal of these pickups in the late 80s/early 90s- great for electrically noisy environments, great for recording work, etc. The magnetic pull on the string is less, increasing sustain. Supposedly, they offer a more balanced response across the strings in all positions as well -- which is potentially important to a string bender. The Blue model is supposed to sound more like a '59 humbucker meets Strat -- darker, more low end and low mids than a single coil, rolled off treble. The Gold model is supposed to sound like a 50's Strat pickup -- bright and chimey with some spank. Whether you like these pickups or not is definitely a personal issue. Personally, I love them...others love 'em, others hate 'em. Perhaps I have a very tin ear, but I don't think that these fall so incrediby far from a traditional pickup's sound. I've heard plenty of awful conventional pickups that couldn't hold a candle to one of these. I really started becoming guitar-aware in the mid 80s, so perhaps that is where some of my sound prejudice comes from. I remember when these started appearing on American Strats (was it the Strat+? -- I can't remember.) My guitar teacher had a guitar with Lace Sensors and I loved his sound. Anyway, they are still selling Lace Sensors (at like $63-80+ bucks a pop, WOW!) 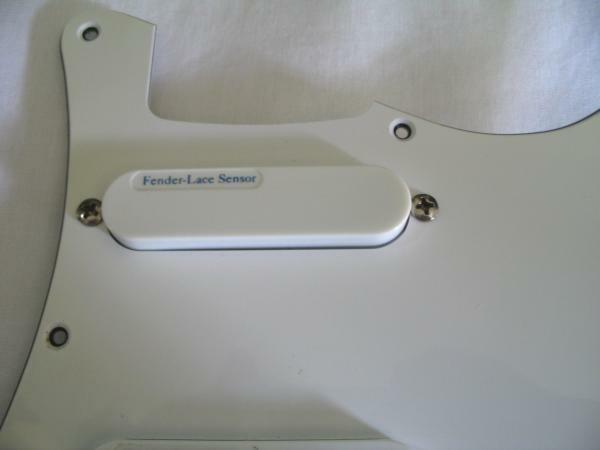 though I don't know if Fender still sells Fender-branded versions. Note -- the Lace Sensors will work in any position. Blue/neck, Gold/mid was my choice but there isn't any reason why you couldn't swap them or put either one in the bridge position. The Hot Rails pickup in the bridge certainly is "hot". Though it's in a tiny package, you can definitely peel the paint off the walls with this thing. Real humbucker sound, though brighter -- which I'm not sure if it is caused by its angle and proximity to the bridge on the higher strings, or its size and coil/magnet characteristics, etc. Great for both lead and rhythm work -- but especially lead. This is a bridge model but there isn't any reason why you couldn't put it in the neck and give somebody ear damage by playing through it there. 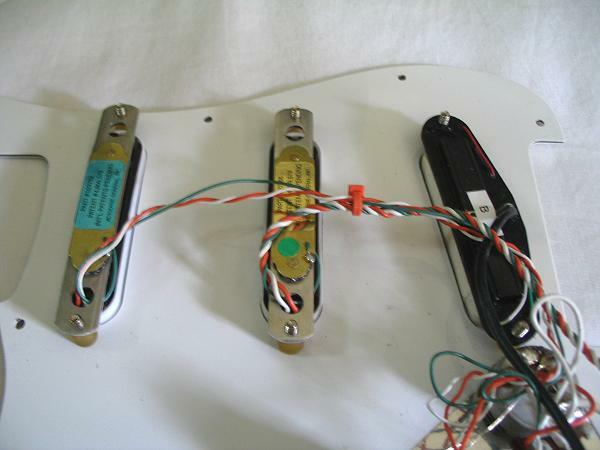 The Hot Rails is a 4-conductor pickup, meaning you can do the parallel/serial/coil-selection wiring up if you want to. 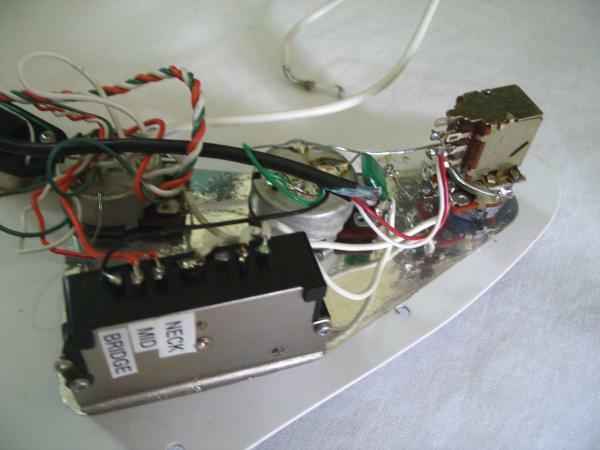 As I said earlier, the pickguard uses only the coil tap (the coil furthest from the bridge) -- UP on the tone knob is single-coil, DOWN is humbucker. Tone control 1 (front) is hooked up to the neck, Tone control 2 (rear) is hooked up to the mid, and IIRC, there is no tone control hooked up for the bridge pickup. 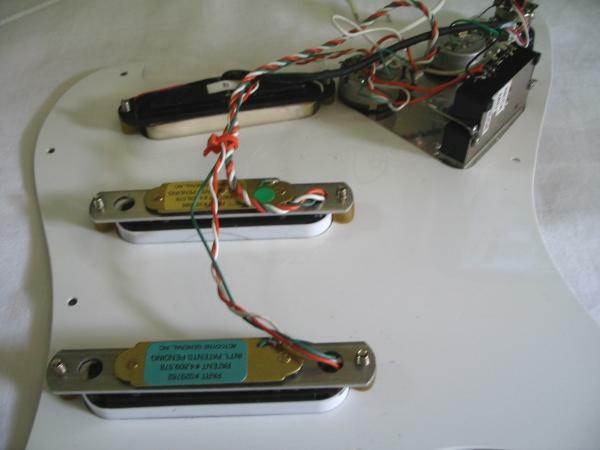 All the pickups work well together, the "in-between" positions work with the characteristic "squak", though they do sound unique. A really interesting tone is the humbucker + the Lace Gold...sounds good, hard to describe -- sort of like describing what the color orange looks like. I guess you'd just have to hear it. 18-year-old switch and pots. I remember that the switch has a little scratch unless you work it back and forth a few times. It might benefit from a spraying with some Caig. FYI. So -- I had all this work done on the guitar this pickguard came from and I soon realized that I had nowhere near the need for the sonic possibilities the new pickups offered. I thought everything sounded awesome, 10,000 times better than the stock pickups. Of course, in my quest to spend money (I was younger and still stupid, what can I say? 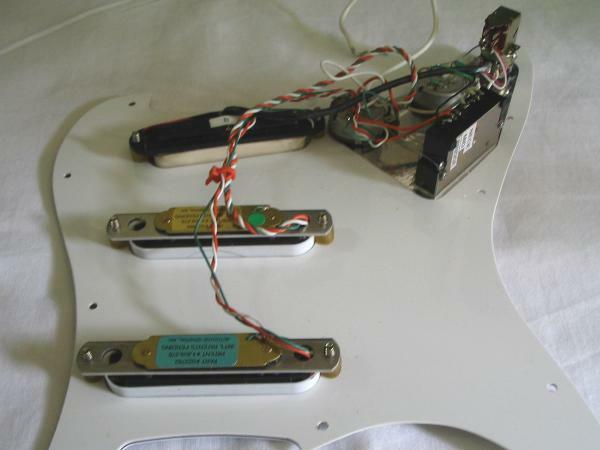 ), I got curious about sticking a single full-size humbucker in the bridge with a single 500K volume and tone, no switch -- well, that's exactly what I did. 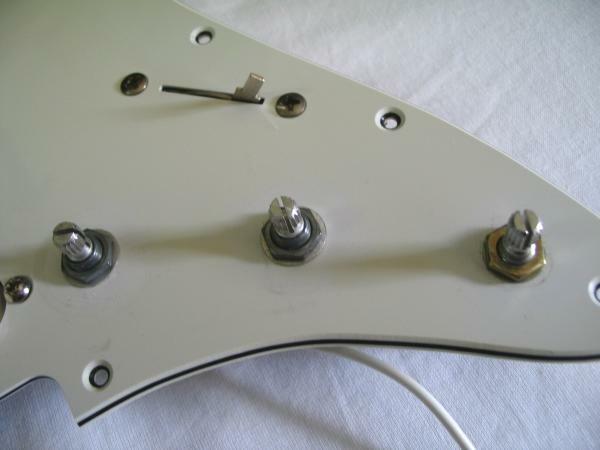 I took this pickguard off and I had a local luthier enlarge the bridge P.U. cavity. I stuck a Dimarzio Super F-spaced in there with a single humbucker hole pickguard and that's the way the guitar has stayed. Shortly thereafter, I got called upon to play bass in a couple of bands and I haven't played much guitar since. Money also got tight meaning no more guitar experimentation. So...the pickguard up for auction has been sitting unused in a box in the closet! I planned to use it again but never did. I had kind of forgotten about it until this latest round of eBaying, and I painfully decided that it was time to let it go. Somebody else is bound to get years of use and enjoyment from the parts, if not the setup as a whole. I believe that gear should be played as well as collected, and this pickup set is not doing anybody any good sitting in my closet! Why am I selling? Along with what you read above, my priorities have changed. I don't play much guitar these days...I do play bass out every now and then, but I just can't see a time when I'll get a chance to put this pickguard on another guitar. Anyway, my loss is your gain. At $1 starting and NO RESERVE, you can't go wrong! Considering that a new SHR-1 costs around $70 and Fender Laces (I guess they do still sell them, eh?) are $55-60, you could get a heck of a deal. Please use the postage rate calculator at the bottom of this auction to determine your shipping cost. Shipping will be, depending on your location, between $3.95 to $6.00 USD for USPS Priority Shipping within the United States ONLY. I will insure your package for the purchase price of the item at no cost to you. I ship with a delivery confirmation (if applicable to the carrier) and I will email the delivery confirmation/tracking number once the item ships.